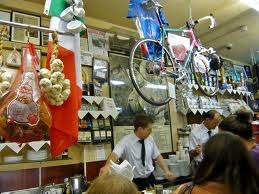 I didn't take a camera, so here's a generic pic of our starting point - Bar Italia, where you can get coffee, cycling jerseys and strange offers of introduction to "handsome boys". I shall keep this fairly short, as it's been a few weeks since I did the ride in question, and these things always work best when they're fresh in the mind. Nevertheless, I want to mention my recent London to Cambridge ride, simply because it was so much fun, and because it ticked off another small milestone for me. We rode from Soho's Bar Italia up to Angel, where we joined the canal and rode out past the Olympic Park towards Waltham Abbey, Sawbridgeworth and onward into Cambridgeshire, momentarily interrupting a TTC 25 before eventually arriving in Cambridge after 75 miles. That's 120km, which feels pretty special to me: it was my first metric century. I'm still hoping to tick off a proper century in the next few months, although I'll confess that without a specific ride to aim for, my training has become a little lax lately. As far as the London-Cambridge ride was concerned, the initial run along the canal was horrible. Not even a little bit horrible, but genuinely why-don't-I-sell-my-bike-and-take-up-hiking-if-I-want-fresh-air-and-exercise horrible. I'd pictured the sort of idyllic canalside riding you sometimes find in Surrey and Shepperton: thin dirt paths, bushes on one side, water on the other, and no one around for miles. Instead we got other cyclists, joggers, dog walkers and people out for a stroll. What I'd thought would be a nice alternative to roads and traffic was actually pretty nerve-wracking. The path itself has a raised lip running up the middle of some sections, so attempts to drift around people can result in that horrible tire-scrape/skid combination, while all the tunnels over the river are entered via a narrow chicane that leaves you completely unsighted-my apologies to the poor jogger I nearly hit! Speaking of nearly hitting people, I have to admit that on a particularly narrow stretch of path somewhere north of Stratford I target-fixated on a line of oncoming cyclists and nearly put one into a barrier. Sorry again, but, you know, not as sorry as if I'd gone into the canal. I've target-fixated once before, and it's a strangely bewildering experience. You can tell you're on the brink of an accident, you make the necessary adjustments, but you're instantly back on the brink of an accident, making an adjustment, but instantly back on the brink of an accident and so on, until you either shake it off or crash. Brrrr. I'm obviously a bear of very little brain and need to sharpen up. Still, rotten canals aside, the rest of the ride was one of the most enjoyable I've ever had. Bright sunshine, beautiful fields and villages, and a spell of around two hours in which we encountered not one single car. Let that sink in. For a two hour chunk of the ride, on road, we saw no cars at all. Idyllic. I was particularly pleased to find that all my repetetive chugging up local hills was paying off as well. Although there were no big hills along our route to really test me, there were a fair few that would once have required an out-of-saddle effort from me, but which I tackled from a seated position, without the granny ring. Yeah, I'm sure that's none too impressive for most of you, but for me it feels like real progress, as hills are the bit of cycling I most look forward to and am least good at. Anyway, after a brief stop in Duxford for a Brie and Bacon sandwich (man cannot live on flapjacks and Clif bars alone) we finally finished up in Cambridge. It wasn't a quick ride, even allowing for a forty minute cake stop and an hours lunch stop, but it was such a nice ride it would have been a shame to hoon it anyway. I had started the ride with a resumption of a habit I thought I'd kicked: overpacking. Somehow it snuck back in on me, and I ended up with a rainjacket, D-Lock, toolkit and ten tons of other crap in a backpack, while my companions were sensibly pottering along with nothing more than a bagel or two in their jersey pockets. I could tell I was carrying extra weight, as the only time I was ever faster than them all day was when we were freewheeling downhill. The extra weight probably accounted for the fact that my back and neck had seized up completely by the time we arrived in Cambridge, but it was nice to know that after ticking off my first metric century it was only my back and neck that were giving me trouble-my legs and lungs could have carried on, if only I'd still been capable of looking over my shoulder for traffic. Oh well, you learn something from every ride. Next time it goes into a jersey pocket, or it doesn't come with me.